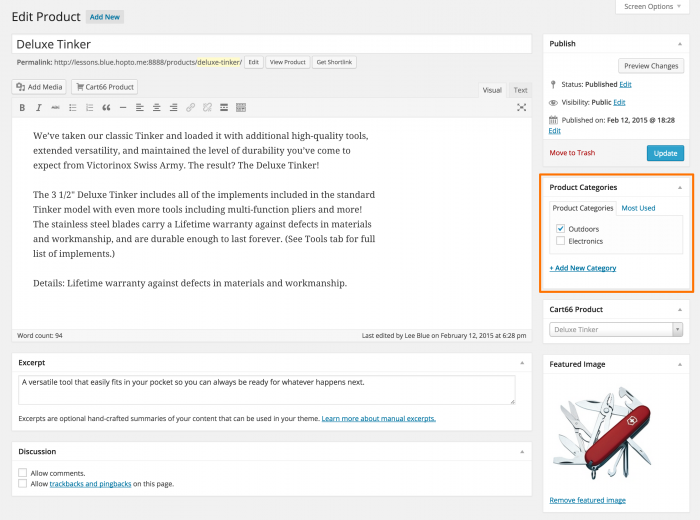 You can organize your products into categories and it works exactly like assigning blog posts to categories. You simply create a set of categories for your products, then as you are creating your product pages you just check off the category to which the product belongs. You can control the order in which the categories are listed. After installing and activating the Intuitive Custom Post Order plugin, navigate to your Cart66 Product Categories screen. Drag-and-drop the categories into your preferred order. For more information on displaying your product catalog, see organizing products with the Cart66 catalog shortcode.